Maps fascinate me. That doesn't mean I'm good at giving or receiving directions. I happen to be one of those chooks who has to turn her whole body around to read a road map, and I am still convinced the sun rises in the west in some parts of the world I've visited. There is just something about a map that draws me to it, and has me tracing its contours and dreaming. I adore fantasy books that have a map to help you understand their world. I think of old maps as art, and can lose myself in their muted colours and the dreams they provoke. My observation is that kids love maps too, particularly creating them. Five-year-olds can learn a lot from representing a finite area like a park with 3D found objects, and older kids relish inventing their own pirate maps, or mapping their classroom layout. Mapping activities provide opportunities for kids to practise visualization, mathematics, interpreting data, drawing to scale, and communicating with an audience. If your child doesn't have an atlas of his own, why not consider buying him one, and helping him learn more about our wonderful world through its pages? Maps and stamp collecting go really well together too, and provide many opportunities for more reading and learning. There are some wonderful sites online that promote mapping. National Geographic has slick interactive activities where kids can search for sunken treasure, explore a pyramid with a robot camera, explore Mars, and more. While playing a "game" at National Geographic, kids are learning about symbols, how to use co-ordinates, scale etc. 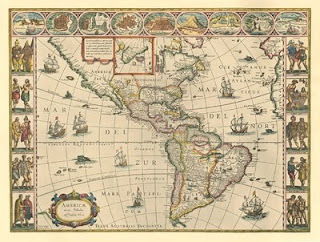 The site also has bite-sized information about maps and mapmaking, for kids who are ready to move past games, and insights into some modern-day explorers. The links for educators page lists many great activities, lesson plans and resources about mapping. I especially like the Mental mapper, which shows the same place from a child's and an adult's perspective. If you or your child share my fascination with old maps, take a look at David Rumsey's Historical Map Collection This site is such a neat way to tap into the visual history of our world. There are over 120 historical maps scanned in, and represented within Google Maps. You can also see the whole collection of over 20 000 images by launching an application called Luna Browser, or use other apps like Second Life and Google Earth. Check out this map of the World Globe 1790, and this fabulous wood block print of Kyoto 1709 (these are via Google Maps so you don't need to download any software to view.) It's a beautiful place to let your imagination roam. Printable World Map has many free printable maps, perfect for home schoolers and teachers. Maps are also in different categories like fill-in-the-blank maps, labelled maps and blank maps. Mapquest has all the features you need to zoom around the world on different digital maps. You can use your mouse to slide the map around, and zoom in and out with the slide bar. Enter country to change maps at top left. I'm sure everybody knows Google Maps, a fantastic resource. Did you know they have collaborated with Russian railways to let you take a virtual tour of the Trans Siberian Railway? Be sure to choose your own music or literature before you start the journey. I chose balalaika, but you can pick rumble of wheels to add to authenticity. Not only are you there looking out the train window, but you can also jump to certain places on the route map. Closest I'll get to the Volga! Scribble Maps has roughly the same features as other online map sites, like zoom etc, but it also lets you scribble on maps, add markers, add text, add images from a url that the site scales to the map via the toolbar in the top left corner. I amused myself by drawing a cat in the middle of the North Pacific Ocean, but I can think of many practical applications for this site. The menu button in that same toolbar gives you the chance to save your work, print it, send to a friend and even create a widget of your map. Fun to try to trace an explorer's journey, or mark out your own holiday route. This is very cool. Geognos isn't just about maps but I'm mentioning it here because it's a handy site for finding facts about countries quickly. Click on a flag to find information about that country. You'll not only see a map you can zoom into and out of, but also photos, history, and geography-related facts. Free maps and mapping-related clip art. American Memory has some lovely old maps in its collections and is well worth a look. When you're finished playing with maps, why not head over to Placefy? This is a game that asks you to identify world cities after looking at a picture. Even if you are not a world traveller, it's fun to try to use visual clues to work out the answer. Recently, I watched a TED video about a huge advance in mapping with Bing maps. This is called augmented-reality mapping. Please take a few minutes to check out this technology. If you're a geek like me, I know you'll be wowed! http://bit.ly/d6CPJe Do you love maps? Me too! Latest Book Chook post with lots of online mapping resources. I too am a map lover. I too am a horrible map reader. I have to turn a map around and around with every turn...I wonder what that says about the way we learn. These map games, exercises, and resources are excellent! I am fascinated by what is happening with AR. I have a feeling that this is going to revolutionize the way that I use a map! It gladdens my heart to know I am not the only one, Kelly! I've come to the conclusion I am a kinaesthetic learner who for many years has assumed she was a visual learner. My instinctive reaction when I want to learn something is always to read about it, but when I'm stressed, I revert to "doing". I love maps too. I've visited the Historical Map Collection. My library has a huge tapestry of an antique map. I like to look at it and pretend I'm a pirate? The other wall has a framed map of my husband's favorite dive sites in the Caribbean. There is something beautiful about maps, new or old. I'm glad you wrote this post. I think maps are an untapped treasure (no pun intended) of creativity for kids. This is so cool. I love being able to use satellite images and "see" where we're going, too. C. love maps ... especially creating treasure maps with a really big X on them. You know Kim, I think we should start something like MA - Maplovers Anonymous! There are so many of us. I rarely met a child who didn't enjoy what i guess I would call creative mapping. The only way I could dim their enthusiasm was to drag in a few curriculum objectives. But when I explained the new skills would help their own mapping, it rekindled some enthusiasm. I'm with C. Strange how often your daughter and I match with our interests. Either she is amazingly mature, or one would have to include I am still stretching toward adulthood! I'll join MA as well if you have a chapter nearby. Yay!!!! Seeing as I put this post together with you in mind, you can take it as read you are a founder member of MA! Aren't they great Jeanne? I just knew you would love that site. American Memory has such lovely old maps too. Happy ploughing!